Every now and then, you will want to refresh the music on your iPhone. Due to the fixed free space of iPhone, users are forced to delete old music files to make way for the new ones. Some prefer to store songs on iCloud. But the free iCloud storage is also limited. So is there any way to remove iCloud music from iPhone? Step 1. Open "Music" app. Locate the song, album or playlist you wish to delete and tab the “...” icon. Step 3. 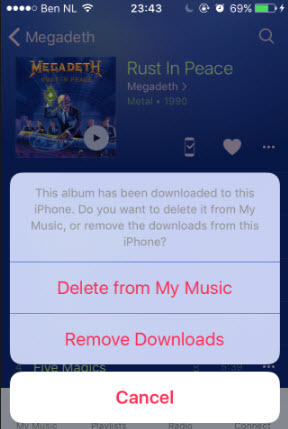 Tap the “Delete from My Music” to remove the song, album or playlist from your iCloud. Choosing “Remove Downloads” only removes the song from your iPhone. In this way, you will find the iCloud songs are removed from your iPhone. Apart from removing iCloud music from iPhone, how do you manage your music library on iPhone? Using iTunes? You may find yourself easily run into iTunes limits or errors, like iTunes crashes automatically, deletes some of your songs, duplicate some songs, etc. In such a situation, an alternative to iTunes is most welcome. Managing your iPhone music with a good iTunes alternative like iMyFone TunesMate would give you an edge, and optimize your iOS experience. "Many TunesMate users are now seamlessly syncing iTunes library between iOS and computer. Some have also reported rebuilding damaged iTunes library with TunesMate, and other users have recommended this app for effective music, video, photos, app, and iOS file management. " Enrich music collection: Enrich the music library on your iTunes or iPhone from unlimited iOS devices, even they have different Apple IDs. Two-way transfer: Extract music from iPhone to, or transfer music to iPhone from computer/iTunes/external HD. Manage playlists: Add, rename, delete, transfer songs from one playlist to another. Delete unwanted music for free: Backup and erase unwanted tracks from your iPhone in order to gain storage space. iMyFone has been winning a great amount of positive reviews from media, like Geek Reply. If you wish to restore your iPhone music files from PC using TunesMate, here are the steps to follow. Step 2: Tap on Music tab on top of the page to open the music window. Step 3: Click on Add > Add File/Add Folder to transfer some songs or folder respectively. Step 4: Click Open to transfer the songs from your PC to iPhone, iPod Touch, or iPad. In iTunes menu, select “Preferences”, double-click to select “General” and deselect the “iCloud Music Library” checkbox. Select “Choose iTunes Library” and select “Create Library”. Give the new library a name of your choosing and turn it on. After organizing the library for some minutes, the library will appear in the “Album View”. Switch to “Song view” from the upper right corner of the drop down menu. You can delete all the songs in the library by selecting all and deleting, if you want. Except to remove iCloud music from iPhone, you'd better learn more tips to manage your music library efficiently.